The model described in this book has been adopted by thousands of nonprofit organizations. When most nonprofits are established, the volunteer board often assumes dual responsibilities – it establishes organizational policies and assists paid staff in serving clients. As a result, non-profit board volunteers become intimately acquainted with fellow board members, staff associates and clients. As the size of the staff increases to accommodate a growing clientele base, the need to offer more professional level service expands. Consequently, the volunteer non-profit board members need to remove themselves from operations, and, with the support of management, to focus on developing strategic policies and assessing organizational outcomes. However this transition often develops too slowly because it is openly resisted by entrenched non-profit board and management personnel. They mistakenly conclude that the greater board member involvement in operations, the better the service to clients and the better the community relations. As a non-profit board member and consultant I have seen significant board member involvement in operations resulting in: unproductive board micromanagement, ineffective support operations, higher operating costs and confusion between staff and board roles. As we conclude the first decade of the 21st century in a recession or depression economic environment, we continue to see that nonprofit organizations – including human service agencies, trade associations, educational institutions and professional associations – need to play an even greater role in this country. Yet, they need to do their jobs even better. They could, that is, if they were more effectively and efficiently governed and managed. Nonprofits cannot continue with their boards assuming a dual role and driving inefficiencies into organizations. Financial resources have become too tight and will likely remain tight for some time to come. For most organizations, it is no longer possible for a volunteer group of directors to be involved in the day-to-day operations. The valued executive director, as the top operating manager, needs to take charge with a strong administrative ability and a strong desire to collaboratively manage the organization. To begin to implement changes, the board needs to upgrade the position title from “executive director” to “president & CEO,” signifying his/her senior responsibility for all management decisions, except for those reserved for the board by custom or through bylaws He/she must be a leader, an innovator, a communicator and a fund developer, all at once. 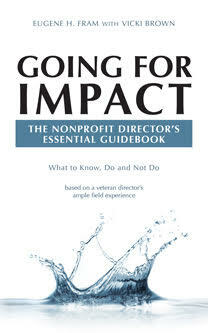 To realize improvements in non-profit management, the role of the volunteer board of directors must also change. This change does not negate the successes achieved by volunteer boards in the past; it is merely a reflection that growth brings new and more focused responsibilities. Such good non-profit leadership makes financial sense through elimination of redundant staff and board activities. Board agendas must be cleared of operational issues best resolved by professional staff. Non-profit board discussions must be centered on policy issues – vision, mission, values and evaluation of programs and goals. Separating operational issues from policy issues is more complicated than it sounds. It requires a fundamental change in a nonprofit’s culture and promotes new relationships and communications styles from the top to the bottom rung of the organization. As far as I can estimate, thousands of nonprofit boards have made the change, and I have yet to learn about one which has not been satisfied with it, although no non-profit governance model is a perfect one as has been recently demonstrated in both the business and nonprofit sectors. The template for this change is described in my book, “Policy vs. Paper Clips: How Using the Corporate Model Makes a Nonprofit Board More Efficient & Effective.” Third Edition (2011) available on Amazon.com with “look inside” feature. Your comments are solicited. Our nonprofit human services organization is celebrating our 60th anniversary in 2010. In 2007 we began a process to transform the governance structure of our organization based upon the principles described in Policy vs. Paperclips by Dr. Eugene Fram. It took us about nine months to research the issues and decide to make the changes. We have now operated under the new structure since July 2008. The new structure follows closely with the one that is described in Dr. Fram’s book. We have three board committees (Executive, Assessment and Planning & Resources). As with any transition there are challenges, pitfalls and moments of enlightenment. We had no board turnover attributed to the changes. The consensus from our board is that we now have much more beneficial discussions at board meetings and board members feel they have more say in the strategy and direction of the organization. If anyone is interested in learning more about our organization’s experience feel free to contact me at dstrick@southstarservices.org.